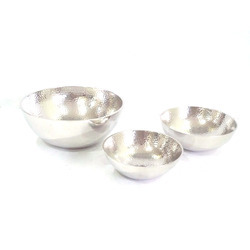 Leading Manufacturer of aluminum footed bowl, aluminum fruit bowl, hammered table bowl, aluminum oval bowl, aluminum embossed bowl and nickel garden bowl from Moradabad. 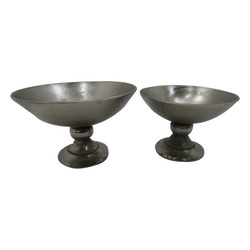 We are one of the leading manufacturers and suppliers of high quality Aluminum Footed Bowl. 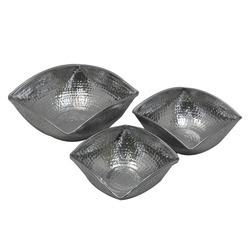 These bowls are manufactured from finest quality aluminum that is obtained from well known vendors. 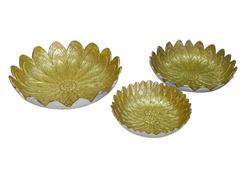 Manufactured in compliance with international quality standards, the offered bowl are widely used as embellishments for the purpose of interior decoration. The offered products are high in demand for their corrosion resistance, lustrous design, light weight, and alluring design. 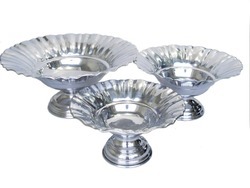 We hold expertise in offering high grade Aluminum Fruit Bowl to our valuable customers. Made from best quality aluminum, the offered products are widely used for keeping fresh cut fruits and salads. The offered fruit bowls are available in various shape and sizes that suits the requirements of the customers. We deliver this bowl within fixed time constraint, due to sincere efforts of the logistic professionals. 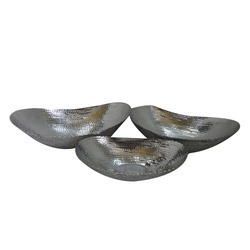 Owing to the rich experience in this field, we have been able to offer Hammered Table Bowl to our valuable customers. 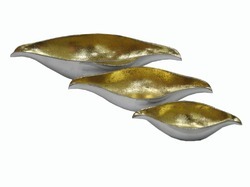 The offered bowls are manufactured from high grade aluminum that is sourced from reliable vendors. Crafted in compliance with the industry set standards, the offered products are highly demanded in the market for their lustrous appearance and beautiful design. We offer Aluminum Oval Bowl to our prestigious customers. 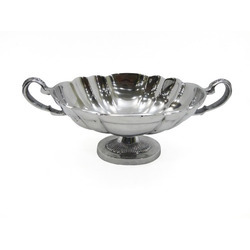 The offered bowl is manufactured from aluminum that is sourced from well established vendors. Available with us at cost effective market prices, the offered products are commonly used for decorating purpose. To ensure delivery of defect free products, the offered oval bowls are tested on various predefined quality parameters by our quality controllers. We are offering Aluminum Embossed Bowl to our clients. We are offering Nickel Garden Bowl to our clients. We are leading manufacturer and exporter of superior quality Aluminum Square Bowl. 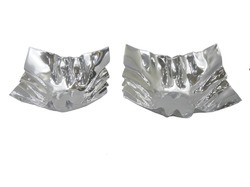 Owing to our vast experience in this domain, we have been able to offer world class Aluminum Sheet Bowl to our clients' end. 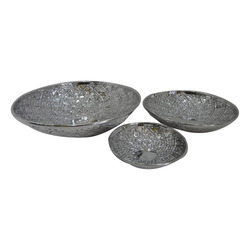 We are leading manufacturer and exporter of superior quality Casted Aluminum Bowl. Owing to our vast experience in this domain, we have been able to offer world-class Enamelled Bowl to our clients' end.